As I sit here on this Friday evening reflecting upon the way in which 2011 has started, my thoughts turn to my film shoot this morning over at NCO Youth and Family Services. What an inspiring organization. I’m wrapping up the final pieces of production for the documentary film I’m producing about the Naperville Exchange Club’s Ribfest, which places a strong emphasis on non-profit organizations who benefit from all net proceeds. As I worked through capturing principal and b-roll, my mind couldn’t help but pause to bask in the fact that since I started my own media production venture, I’ve never had a more rewarding and enjoyable year-and-a-half of work in my life, not to mention family balance and plenty of cherished moments around my two rapidly growing little men-in-training. My business is a thriving success from the standpoint of being able to do what I love for a living connecting and collaborating with great people. At the same time, there is that uneasy tension that all business owners feel with regard to the nagging need to make money… you know, for life’s indulgent luxury’s such as that roof overhead, food and taking care of the most cherished possession of them all… my children. I started my business for one simple reason… to live my purpose in the service of others and be an example to my children to follow their passion in life. I love people… I love to help people solve problems… and I love to tell inspiring stories. While 2010 was a fruitful year for my business, 2011 has started out as one that leaves that uneasy feeling in your stomach. Yet, I’ve come too far through my professional and personal evolution in life which was full of its own share of sobering highs and crushing lows to ever considering turning back. So what’s going on? Well, I’ve been told by someone very close to me that my weakness is I simply give too much away. I would be inclined to protest, but the irrefutable evidence against me in the wide span of pro bono and speculative projects I’m working on these days only yields an airtight case. Even more, I’m a passionate ball of energy when I meet potential clients and end up spending hours of thought and research to bring as much to the table as I can offering up ideas and strategies that most everyone else would require a fee in exchange. I do it because I simply can’t not do it… it’s the relentless and inexhaustible creativity that takes over. I’ve been in and around the media business for many years, yet never so focused on taking chances, bringing big creative visions to life and placing my full 150% percent effort into all that I’m producing. I believe it shines through in the herculean effort and devotion I pour into creative media production. While I hope to one day be sharing the best examples of the pilot projects I’m working on right now, below are a couple of brief examples. This is just the beginning for me. I’ve never expected anyone to “swing open the door” without extending effort. But I hope and pray each and every day that my blood, sweat, tears, passion and determination earns me that ticket into the door to help tell great stories and to create with a little less fear of where that next check is coming from. Isn’t that what true dreams… the ones which have been with since your first memory, that something that you were uniquely put on this earth to do… are all about? It’s been a tough week, yet all I can do is put myself out there and work as hard as I can knowing I’m where I’m supposed to be, doing what I was meant to do and loving every minute of the creative process. Perhaps this post might resonate with you and inspire you to think about your own life and purpose. When I was a kid, I distinctly remember the brisk evening when my Cub Scout Den visited the local Hardin County Jail in Elizabethtown, KY. Some images as a child you simply can’t forget. So as you might imagine, it was more than deja vu when my youngest son’s Tiger Scout Den Leader announced our trip to the Naperville Police Department. Under the brisk darkening skies of this January afternoon, I headed out with my partially scout uniform compliant six year-old, driving past the lingering twinkle of holiday lights defying the distancing days which are striving to sever the magic of the holiday season from our plummet into the dark dull days of Winter. We drove up to the Naperville Police Department and I covertly studied my son’s face in the rear-view mirror, wondering what was going through his budding mind as we inched closer to a place which can only serve as a stark contrast to the innocent colorful confines of Safety Town just across the street. My son was uncharacteristically quiet, clinging to my larger hand a little tighter than usual as we walked into the empty lobby. We were greeted by two officers sitting behind a somewhat menacing looking cold metal reception desk. Though, with a smile they took one look at his signature safety-orange colored Tiger Scout standard-issue scarf and directed us into the Community Room where the rest of his pint-size nature-loving citizens in training waited. It was astonishing how uncharacteristically quiet and compliant our small pack of otherwise unbridled energy junkies were as we waited. We were led through the Department by a non-uniformed community service policing representative and it immediately became clear we had an all-access pass. The boys walked ahead of the parents throughout the premises in the straightest single file line I’ve ever seen achieved by a group of six year-old boys. We saw the briefing room, the 911 center, the large police vehicles, the small police vehicles. However, nothing could possibly top our journey into the heart of the cell block where the arrested spend a bit of reflection time. Fortunately, there was nobody being held which meant we could go inside and let the boys spend a little bit of timing sitting inside one of the jail cells. A cold metal bed and even colder looking metal toilet was all the interior decoration to be viewed against the stark cement block walls. To make the proper translation, we pointed out the fact there was no Wii or Xbox inside the cell. 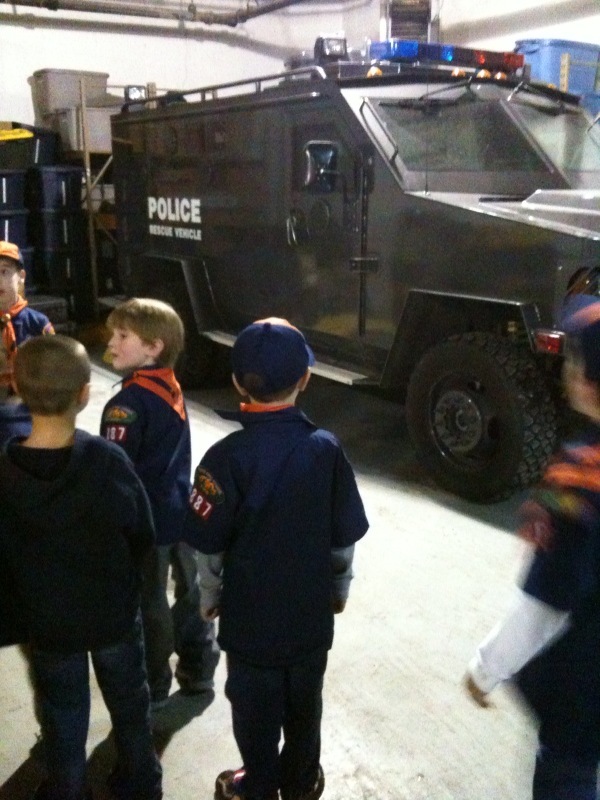 I think it was all a real eye-opener for our Tiger Scouts. Even more, it was a reinforced affirmation to me of what a top-notch, well-equipped police department and force we have here in Naperville. A couple of years ago, I did a program at the Naperville Police Department as part of the Naperville Citizen’s Academy, and it appears our law enforcement continues to improve. As for my son, half way home in the car he revealed to me why he had been so quiet. He slowly confessed, “I was a little bit scared for two reasons. First, I was afraid the police officers were going to arrest me. Second… uh… I can’t remember the second…” But, by the end of the tour and by the time we got home, his brave excitement and new stories were shared freely with his older brother and Grandfather. He has vowed to never take anything from his brother’s room without asking again. I think we might be able to squeeze at least a few days out of such a six year-old pledge. So many thanks to the Naperville Police Department for everything you do, not only in keeping our community safe but most importantly serving as a positive presence in our children’s lives.